Olé! Let's get ready to rumba! You've got the need to kick up those heels and show off your dance moves up and down the Spanish Steps. Will you fandango your way through the night? Or maybe tonight you're in the mood to rumba with the señor in the room who has the best dance moves to match your own. Just take care not to injure anyone as you twirl and kick around the room! Or maybe you don't care for simple dances. 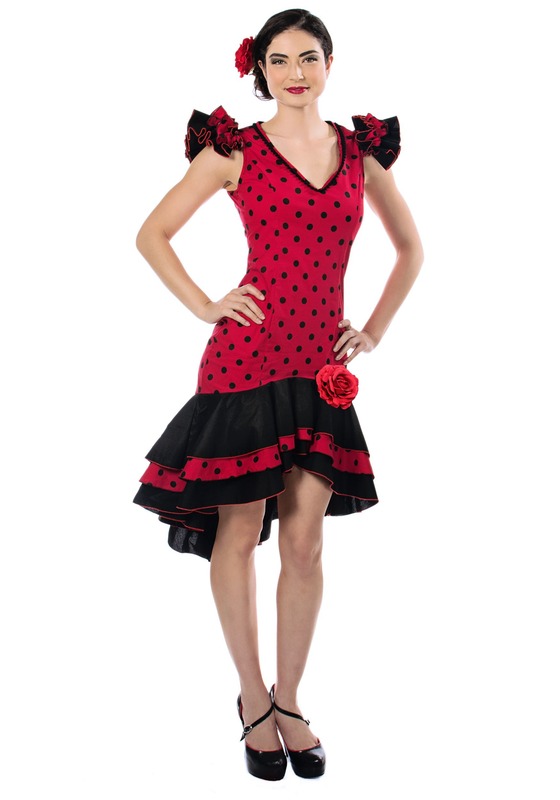 With this costume we get it, the red dress with black trim is for advanced dancing. 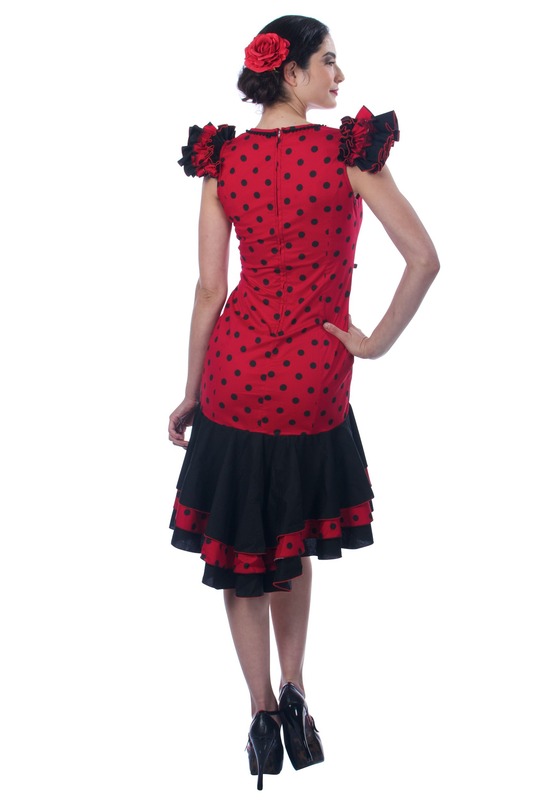 It's got a mid-century feel with black polka dots on a red background. You'll love the black and red ruffles on the sleeves and the asymmetrical hem that compliments your stomping and twirling perfectly. This dress is ready for a challenge. Ready for the flamenco, the Spanish gypsy dance internationally famous. Precision, control, the ability to pull people's attention like a moth to a flame. That is flamenco, and that is the fire which burns in you. When someone asks if you want to dance you say no. You don't want to dance. You need to dance. Like a person needs to breathe, your feet need to tap across a dance floor. The Spanish passion flows in you and out through your feet. Help the people to understand what it means to dance with your whole soul! Too small and stitching was unraveling when I opened the package. Previous costume I ordered was a perfect fit following the sizing chart but this dress is too tight. Disappointed but will try to make it work. I purchased this costume to wear as part of a couples costume with my husband. Right out of the bag it looks like it is well made and good quality. It was somewhat wrinkled but nothing that a little ironing and fluffing couldn't solve. The only issue I have is with the sizing. I wear a size 6 and according to the sizing chart needed an XL. Good thing I did that because it fit pretty much perfectly! Not sure who could even wear a size S but do yourself a favor and pay attention to the sizing chart when ordering otherwise you will be sorry.